ITERATIONS is a musical experiment: we are juggling with artistic processes. How does music resonate through other music? What happens when the game of Chinese Whispers meets a dynamic feedback loop? In a live concert in Berlin, Ensemble Extrakte – a trans-traditional ensemble led by Sandeep Bhagwati that unites musical folk, jazz, and art music traditions from India, Korea, Syria, China, Bulgaria, Armenia, the US and Europe – plays to music in their headphones: they interpret pioneering techno and electronic tracks put on by Berlin-based brothers Teichmann. But definitely not in the sense of “Beatles go Classic”: they do not simply echo the melodies and harmonies – rather, inspired by the energy and playfulness of the tracks, they improvise a resonant response, transforming and filtering the electronic sound they hear through their traditional instruments and musical expressions. Extrakte Musicians, finding new connections in their sounds. What do we hear now? Who is interpreting whose music? Who is influencing whom, which sound is related to which? What is played live, what is a sample? ITERATIONS is an ongoing project, a creative love affair between traditional and electronic music making – this album is the second step. What will be the third? In 2014 Ensemble Extrakte and Gebrüder Teichmann met for intense listening of a personal selection of early electronic club music in preparation for their concert „Iterations“. The idea was to carefully discover the mechanisms how this music works and translate them into playing techniques for the ensemble. During the performance at Radialsystem V on Nov 14, 2014 in Berlin, the ensemble played a live-interpretation of a “silent dj-mix” by Gebrüder Teichmann, that only the musicians could hear in their headphones. The concert also included a section with flexible multiple metronomes by Sandeep Bhagwati and a section with samples from the Klangarchiv of the Ethnologische Museum Berlin, processed by Gebrüder Teichmann. The 2-track recording of this concert was then edited, reinterpreted and remixed by Gebrüder Teichmann at their studio and put back into a new format: the CD “Iterationen – resonant responses to a live-concert”, carefully muffled with a beautiful designed cover by Brenda Alamilia containing a 24-page booklet which includes a conversation by Sandeep Bhagwati and Andi and Hannes Teichmann. The brothers Andi and Hannes Teichmann are among the most innovative djs and electronic live musicians in the berlin scene. In addition to their local activities as musicians and concert organizers, they have been traveling around the world for years, always working with local musicians of all genres to create trans-traditional music projects. But they also regulary work with european art musicians e.g. Ensemble Modern, Robyn Schulkowsky, Embryo etc. Taking their cue from the insight that we live in post-exotic times in which many musical traditions prosper and proliferate in a way that ignores geographic, ethnic and ideological limitations and world orderings, the musical cosmopolitans of Ensemble Extrakte want to explore and examine the musical potential of traditions they know – as well as traditions alien to them. Ensemble Extrakte was founded in 2013 by Elke Moltrecht and Sandeep Bhagwati. Composer, conductor, poet, professor at Concordia University Montréal and director of matralab – a lab for interdisciplinary research-creation. Musical director of Ensemble Extrakte and of similarly trans-traditional ensembles in Montréal and Pune. Musicologist, music curator, producer and consultant. Co-founder of Ensemble Extrakte. She directed the Music Department of Podewil – Center for Current Arts, Berlin, the Ballhaus Naunynstraße, Berlin, the network for contemporary music Musik 21 Lower Saxony, and the Academy of the Arts of the World in Cologne as CEO. 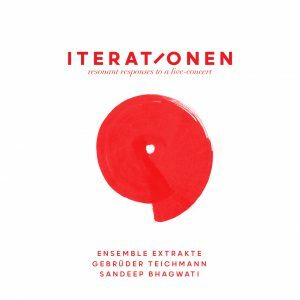 The original recording of the „Iterations“ concert was commissioned by the festival Faithful! Fidelity and Betrayal of Musical Interpretation (November 13-23, 2014), curated by Elke Moltrecht. Both the research phase for the concert and this album were realized with generous support from the Fonds de Recherche du Quebec Société et Culture, matralab (Concordia University Montreal), the Canada Research Chair for Inter-X Art, Chinesisches Musikzentrum Berlin and the Gesellschaft für Traditionelle Musik Berlin e.V. Stereorecording of the concert „Iterations“ at RadialsystemV on Nov 14, 2014 by Jacek Szczepanek.